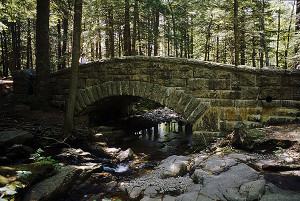 Acadia bridge built for carriage roads. One of the most frequented attractions in Maine is Acadia National Park, not only during the summer season, but also in the autumn season as well, with some great opportunities for fall foliage viewing for the “leaf peepers.” Most people when they visit Acadia National Park, they stay predominantly on Mount Desert Island, with its commercial establishments for tours, fine dining, artisan shops, hiking, beaches, Cadillac Mountain, and bike riding through the carriage roads that meander through wooded regions, which all are favorite attractions. 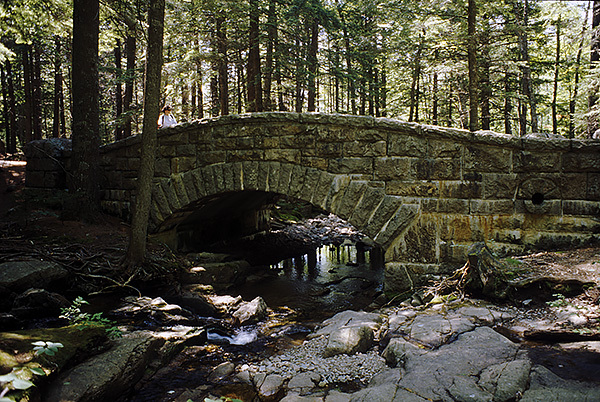 In total, there are 120 miles of hiking trails and paths that are often interconnected and combined with these original carriage roads built by the Rockefellers during the Gilded (Golden) Age of Industrialism, when the park was established. But, for those who wish to venture a little northward off the island will find untouched regions and quaint fishing villages that have remained the same for many generations. This area in Acadia involves the Park Loop from Mount Desert Island onto northern Acadia National Park’s Schoodic Peninsula. Head over Route 186 towards Winter Harbor and enjoy the views of Schoodic Peninsula, Schoodic Head, and Schoodic Point. Here, as you drive slowly along the park’s one-way loop road and take the road to Schoodic Point, you’ll find trails that branch off the paved road leading atop huge hilltops that provide breathtaking views of miles of the ocean. Look for one near a Blueberry Hill sign along the way. Take this particular trail to the top of the hill where you’ll find breathtaking views of the bay, its islands, and a distant view of Petit Manan lighthouse. During high tide, when you reach Schoodic Point, you’ll find ocean surf smashing against a nearly 400-foot headland of rock formations. 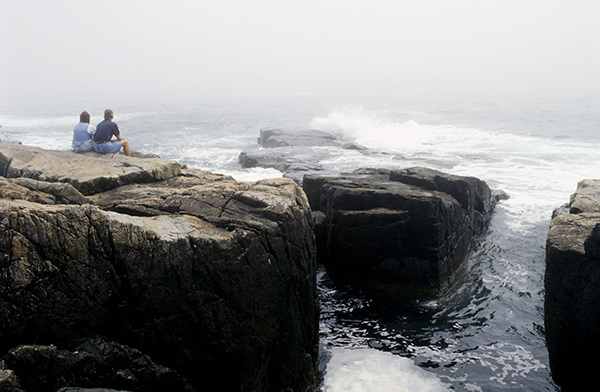 Schoodic Point with its rock formations. Winter Harbor is a classic down east fishing village that is still thriving today for lobstermen and scallop draggers. Part of this is due its location, where the harbor rarely freezes over in the winter months. Privately owned Winter Harbor lighthouse can be viewed from the park loop road from Mount Desert Island onto Acadia National Park’s Schoodic Peninsula. Outside of Schoodic Point, the town of Prospect Harbor is a quaint fishing village where you can enjoy some nice walks. Prospect Harbor has been a busy fishing harbor since the mid-1800s. 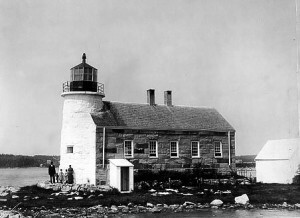 The existence of Prospect Harbor lighthouse was determined by the local fishing industry. It was originally built in 1850 of granite, and then deactivated between 1859 through 1870 when harbor use and the local fishing industry decreased. It was reactivated in 1870 with increased use of the harbor, and then rebuilt in 1891 of wood, to guide the traffic of coasting schooners and fisherman. Even today the lighthouse guides lobster and sardine fisherman to and from their homes. Vintage Image Built in 1850. Courtesy US Coast Guard. The American Lighthouse Foundation helped to save the historic beacon from imminent collapse in 2004 when critical restoration was applied to the lantern and gallery. Prospect Harbor lighthouse is unique in that it is an active military base, and is the only beacon considered haunted in the Acadia and Down East regions of lighthouses. However, it is not open to the public, but you can photograph it from Prospect Harbor. You cannot go onto the lighthouse grounds because of security reasons, as it is part of a military installation, and is actively more secure than a regular Coast Guard station. To get to the lighthouse, from US Route 1 take 186 to Prospect Harbor. Turn right on 195 then bear right at the fork onto Lighthouse Point Road. You can view the light off from the shoreline outside of the gates. Today, as the lighthouse and grounds belong to the U.S. Navy, the keeper’s house is available for overnight stays for active and retired military families. You can relax and picnic and view Prospect Harbor lighthouse from across this small harbor. Purple lupine flowers are quite abundant in this area in the summer months. The keeper’s quarters is used for navy personnel, where it is called Gull Cottage. A former light keeper’s ghost is said to haunt Gull Cottage which some call Captain Salty. Over the years some of those that have stayed at the keeper’s quarters have mentioned some paranormal activity occurring quite frequently. It seems that a small statue of a sea captain, located out of reach on a high ledge at the top of the stairs is consistently being moved facing the stairs one time, then the occupants will notice the statue would be moved to face the sea another time. Some guests have claimed to see a ghost like figure at night, while still others report smelling tobacco smoke when no one is smoking, or doors opening and closing, lights going on and off, and other odd occurrences. Enjoy the fall foliage in New England! 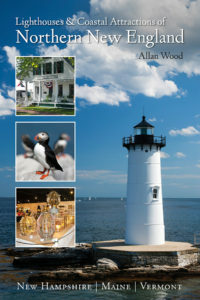 My 300-page book, Lighthouses and Coastal Attractions of Southern New England: Connecticut, Rhode Island, and Massachusetts, provides special human interest stories from each of the 92 lighthouses, along with plenty of indoor and outdoor coastal attractions you can explore. These include whale watching excursions, lighthouse tours, windjammer sailing tours and adventures, special parks and museums, and lighthouses you can stay overnight. 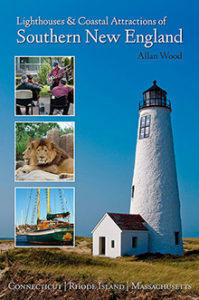 You’ll also find plenty of stories of shipwrecks and rescues, and of course, some haunted lighthouse stories. 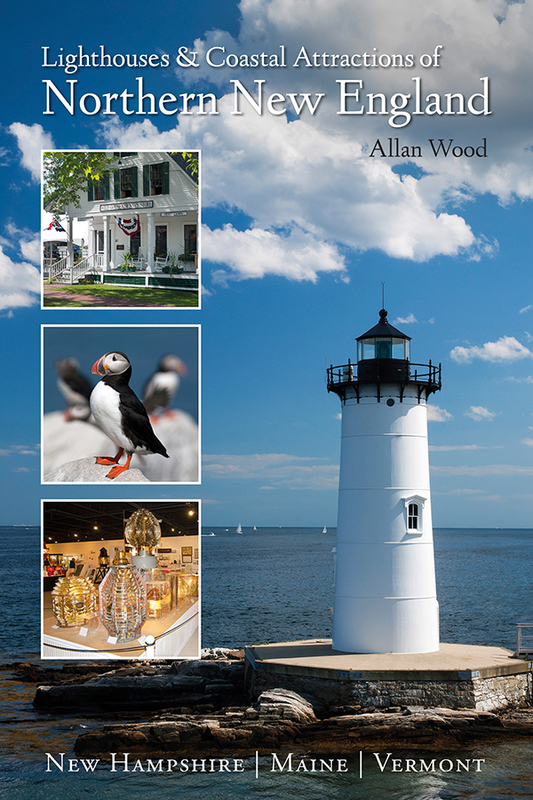 Lighthouses and their nearby attractions are divided into regions for all you weekly and weekend explorers.